All I knew about Lake Tahoe prior to the weekend was that the bike featured a lot of climbing and was at altitude – it was likely to be tough. With new races at unfamiliar locations I’m reliant on forums to fill in a venue’s back story. I hadn’t anticipated that a tough course would also meet such cold conditions. The results are unsurprising and Ironman Lake Tahoe looks to have a claim to the title of slowest race on the Ironman Circuit. Whenever a race proves tougher than expected there is a jump in its DNF rate over the Ironman average of around 5%. The figure I’ve seen quoted for Lake Tahoe is 35%, but as I’ve discussed previously DNF numbers are often inflated by DNS numbers. 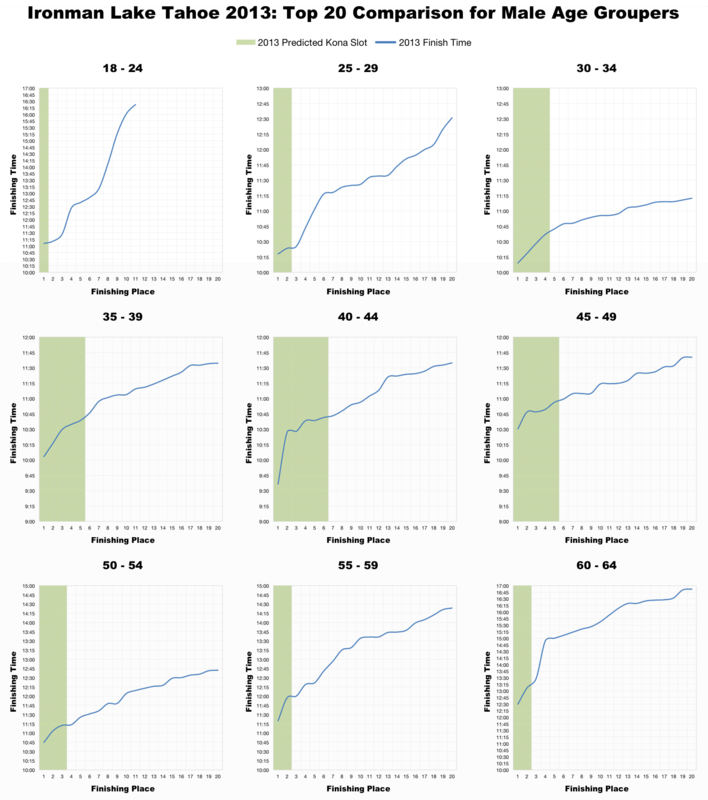 The table above shows the DNF rates based on the number of age group athletes who signed up to the event (bib list) and the number registered to start (Athlete Tracker). Based on the bib list we do get a DNF total of 35%, but 385 athletes (14.5%) weren’t even present on race day. Using figures from Athlete Tracker gives us a closer estimate of the DNF rate based on those registered to start – it will still include those who chose not to race on the morning. This yields a figure of 25%; Ironman St George 2012 is the only other recent race to have a clean DNF rate over 20%, Los Cabos is also close at around 20%. 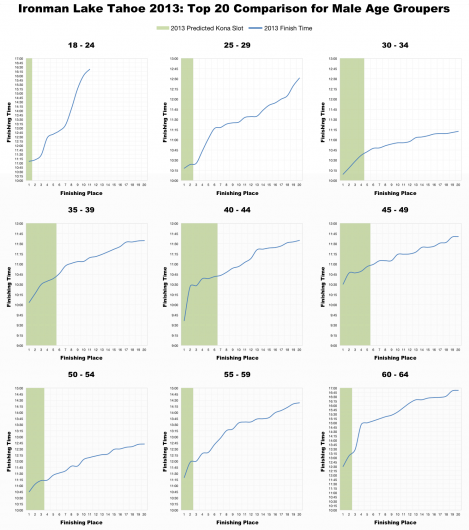 Knowing that a higher than normal percent of athletes didn’t finish we can also see in the distribution above that those that did were slower. 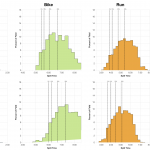 Not so much in the swim, but bike, run and overall splits are all strongly skewed; the difference to the typical North American distribution is quite distinct. 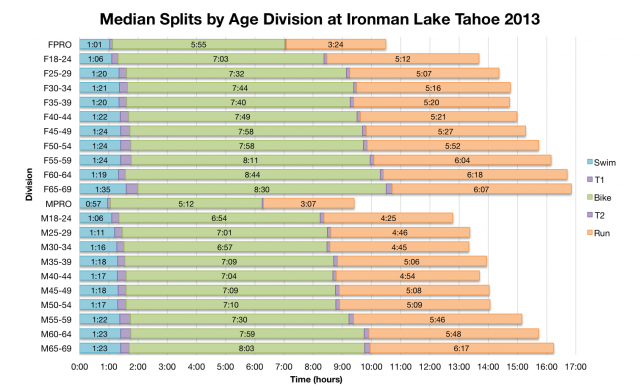 That the Lake Tahoe run splits lack much weight over 7 hours reflects the fact that athletes running that pace likely missed the cut off after an equally slow bike. Using Ironman St George for comparison again it’s apparent that, aside from the swim, Lake Tahoe was a slower event than the 2012 edition of St George. Cold conditions, altitude, plenty of climbing – this is not a fast race. 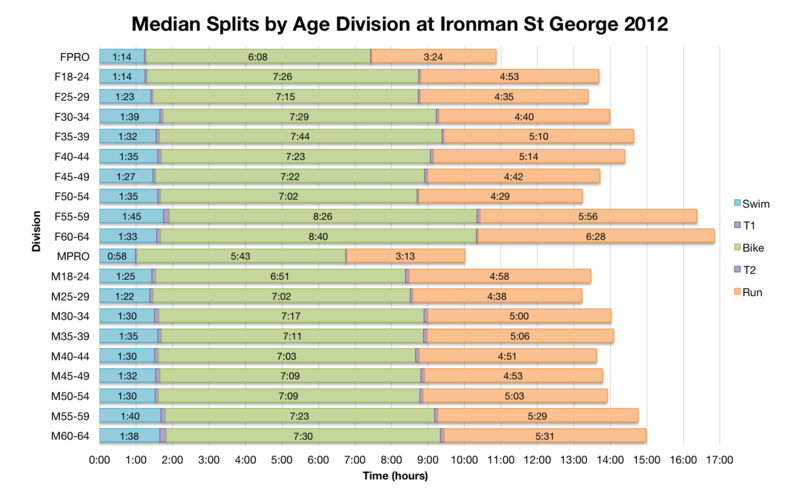 The median splits for each age group provide further confirmation. 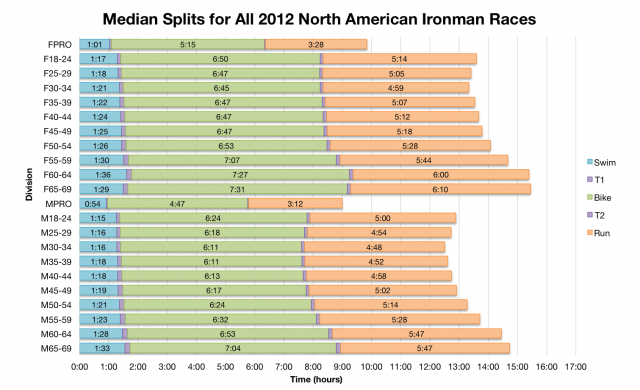 Swim times are comparable with the North American median and run times aren’t too far off, but bike splits are much slower than the average. 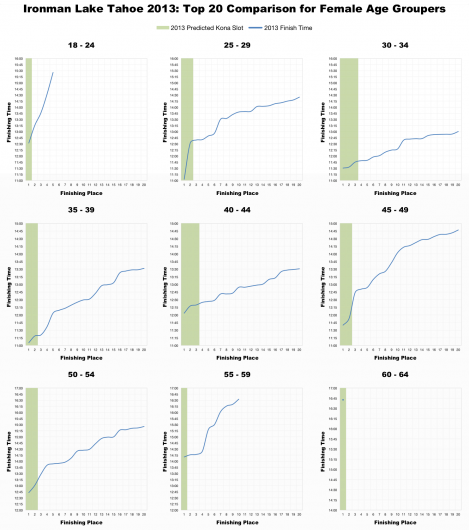 Even the pro field was significantly slower on the bike at Lake Tahoe. Comparing to Ironman St George bike and run are broadly similar, but the swim is faster. Pro splits suggest Lake Tahoe may have been the faster race, but we can see among the age groups, particularly the older women, there are some distinctly slower times at Lake Tahoe. There are certainly a lot of parallels between the two events, but the split distributions point towards Lake Tahoe being the slower. The above slots are estimated based on the number of athletes completing the swim in the Athlete Tracker (not those in the original bib list), actual figures will vary based on start numbers. However the table provides a rough guide to the allocation and enables us to look at the times required to qualify. Unsurprisingly the top 20 in each age group post slower times than we’d normally expect at an Ironman. The drop off in performance between first and tenth is also much faster than we usually see in competition for Kona slots. For a real indication of how much slower this race was it should also be noted that one solitary age grouper in the M40-44 division broke 10 hours. Qualification was less a matter of speed than strength and consistency in the face of a tough course and conditions. 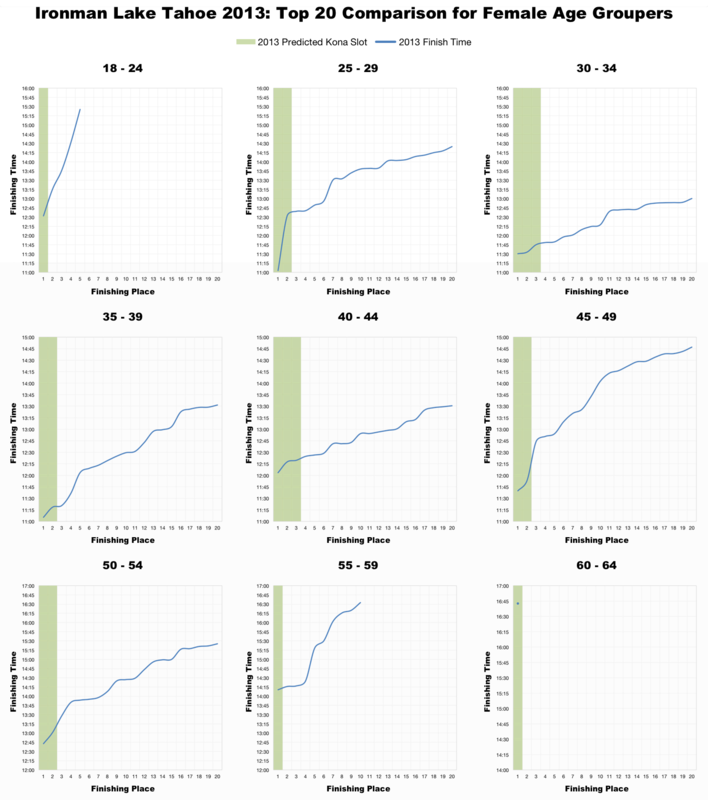 Ironman Lake Tahoe is the slowest race I’ve analysed this year, certainly on the Ironman Calendar at the moment. Of course with only 1 year of data it’s impossible to know if this will prove to be the norm for the race or a slow extreme. Clearly though it’s always going to be a challenging course. 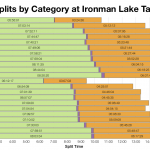 I’ve uploaded a spreadsheet of the results and splits for Ironman Lake Tahoe 2013 to my Google Drive.